This weekend marks the first of several Garden Shows where we have a booth offering products from The Rosemary House. It symbolizes the end of winter as thoughts turn toward spring. The show runs Thurs. thru Sunday, and for additional info, visit their website. Rebecca Kolls from Rebecca's Garden is the featured speaker on Saturday; with other programs scheduled throughout the weekend. Rosemary House products are available here from tea pot cookie cutters to herbal beer bread to our favorite Roastmary, it's amazing what you might find in this booth, even fairies. It's a great place to find a little whimsy to add to the garden. These concrete garden ornaments hold up well to the weather, and are fun to tuck into a little spot in the garden. If you stop by the show, be sure to greet Susanna and Marj! It's Here! The 2008 Calendar of Events! It's always exciting to finally have the Calendar of Events in our hands.... weeks of planning, proofing, making phone calls, thinking of new ideas... January is spent deciding what we want to do with the rest of the year. And now we know. This is a very special and exciting year as The Rosemary House is celebrating their 40th Anniversary this year! 1968 - 2008. Is that amazing? We have pages and pages of events including A Pirate Tea with Captain Eliza Blackheart, a special Scottish Tartan Tea with Elizabeth Knight which includes a copy of her newest book Celtic Tea With Friends. We have new events and old favorites including Tea and Tarot in July and our holiday teas in December. It promises to be another exciting year, and in celebration of our special anniversary, we have 'Retro Pricing' with some of our events priced at $19.68 to honor the year Rosemary House was established. I'm looking forward to a special Garden Party in May, our way of saying Thank you to all our valued customers. If you are in the area, stop in the shop (closed Sunday and Monday) and pick up a copy; those on the mailing list will receive a copy shortly - we will get them in the mail as soon as possible! If you would like a copy and you aren't on our mailing list, email your snail mail address to us. The information will also be posted on our websites shortly. In the meantime, it promises to be an exciting anniversary celebration, a year of special events and many smiles. A year of Rosemary for Remembrance. 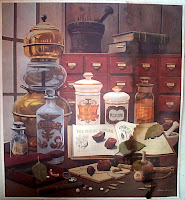 The medicine cabinet in the tea room is designed specifically for those that want to peek inside! Filled with antique jars that contain assorted dried herbs, lavender, rose petals, sandalwood, and even green tea, it is arranged with little nicknack's to amuse. On the upper right shelf, there is a lavender wand from a craft class from years gone by and several handcrafted roses my mother made using fresh ginkgo leaves. A fragile rose pin, crafted from a real rose, too delicate to wear, graces one of the shelves. The Dragon pearl jasmine tea is tucked in a corner. This green tea is beautiful, each pearl hand rolled, the fragrance divine, floral tones perfectly balanced with the tea. Almost too pretty to use! Most guests comment that there is too much to look at and read in the powder room! I never really know if they have peeked into the medicine cabinet or not. Our old house has a very small powder room off the kitchen on the first floor. This is the potty that we use most frequently downstairs and the one that our visitors use. I am always surprised at how many come out of the powder room and comment on how interesting the medicine cabinet is. I always want to ask them what they were looking for…..
Our medicine cabinet holds some basics – band aids and a cover for an ice pack. But we also have a variety of what others call “alternatives”. Tea Tree Oil: safe to use directly on the skin, a wonderful anti-fungal, my favorite use is on my pierced ears when they get mildly infected. Also used on diaper rash, acne, wounds, and insect bites. Lavender oil: again this pure essential oil is safe to use directly on the skin without a carrier oil. We use it for burns of all sorts, sunburn, stove burn. In my opinion it works better than aloe vera. It is also very relaxing and often relieves muscle pain and headaches. I also make a lavender floral spritz where I mix lavender essential oil with a small amount of alcohol (any kind) and then mix that with water. I put that in a spray bottle and spritz all through the little ones bedroom to calm them down into a restful night sleep. You can also use this floral water to spray on linens before ironing. Bach Flower Rescue Remedy: my absolute favorite Bach Flower Remedy, I have it in all medicine cabinets and in my purse. Just a couple of drops under the tongue or even on the wrist to calm and quiet any trauma: nightmares, vaccinations, bad falls, also severe emotional stress – like a death. It truly does rescue you. Boo-boo salve: I make my own but there are lots of high quality salves available at Herb Shops and Herb Festivals. My salve is made with olive oil infused with Calendula –very healing to the skin for cuts and scrapes, plantain which helps with itching from bug bites, yarrow to stop the flow of blood and finally comfrey a powerful wound healer to heal broken skin. I add beeswax to the infused olive oil to create a thick salve. We always try to use a spoon or Popsicle stick to take the salve out of the small jar, this will prevent bacteria from being introduced into the salve. I also make small batches because it will go rancid over time. We use this on any dry cut, scrape, splinter, even chapped skin or lips and more. For anything that is oozing we use the dry powdered yarrow and/or comfrey leaf that we store in small yogurt containers. Ginkgo Tincture: For mom’s headaches. I get very tight vice like gripping headaches. Ginkgo is wonderful for those headaches. It is a vasodilator and increases cerebral circulation thereby loosening that tight grip. If you get headaches that feel like your head is going to explode at any moment – feverfew is probably more your headache herb. Again I make my own, stay tuned as herbal preparations will be covered in future blog posts. This is also readily available at http://therosemaryhouse.com/ to purchase. Echinacea extract both alcohol based for the adults and glycerin based for the kiddos: our favorite immune boosting herb for when you feel the crud coming on and for when you have the crud. We really use Echinacea heavily in these situations. Motherwort: As the name suggests this is another herb for Mom, excellent for anxiety and irritation due to PMS or Menopause. It is also used for those “YOU KIDS* ARE ON MY LAST NERVE” moments. *feel free to substitute boss, husband, coworkers, lousy drivers, etc here. I keep a one ounce tincture bottle in my cabinet and the other ½ gallon refill bottle under the sink. Finally Bitters: folks often ask me what I take on a daily basis. Bitters is the answer. This is a blend of warming and cooling bitters like dandelion root, angelica root, orange peel, gentian and peppermint. There are others but that is a formula that I like. It is bitter and you must taste it in order for the herbs to work. Bitters effect your entire digestive process from start to finish. Taken 30 minutes before meals, the action begins in your mouth where it increases saliva production. The increase in saliva production tells your tummy that food is on the way and to increase hydrochloric acid production,. This chain reaction continues the increase in hydrochloric acid production and tells your liver to get into gear – that food is on the way in turn increasing liver, pancreatic and small intestine digestive enzymes. It is truly amazing how it affects your absorption, and elimination. It is helpful for hypochloridia, malabsorption, chronic gas, indigestion and more. My herb teacher taught me to always remember and never forget “You are what you don’t excrete”. Ok OK I admit it we have a few “alternatives” in our medicine cabinet. You will find a small bottle of acetaminophen tablets and some pink stomach relief tablets so the visitors who sneak a peak into our medicine cabinet don’t think we are totally off the wall. Please Note: Seek medical attention as necessary. These herbal alternatives are not meant to take the place of your physician. 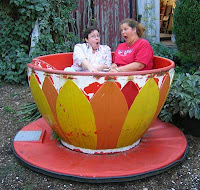 Teacups, teacups, and more teacups. 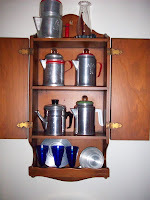 The original collection was started by my mother, which she gave to me when I opened the tea room, allowing her more space for her expanding collections! Most of her teacups are in this little built-in shelf unit that appears to have been built specifically for tea cups. It is tucked in a corner of the tea room, behind glass doors, silently waiting for someone to notice it. These are probably some of my older teacups, more cherished, and thus not used frequently. This collection of teacups hangs on the wall in the tearoom, and are what I consider misfit cups. If you look closely, you might notice a chip here or there, or a handle missing, or even a plate that doesn't quite match the cup. Broken from use over the years, these cups have been retired, and add decoration to the wall. The unique shell cup in the center is a treasure a sister found for me - not a misfit, simply too pretty to use! These beautiful violet tea cups were part of my inheritance from my dear Aunt Hilda, my mother's sister. Afraid they will get broken if I use them, they now grace the tea room, part of the many collections on display. My plan was to have tea with my mother using her sister's teacups, but sadly, my mother passed away less than 3 months after her sister, before we found time to sit down to tea. 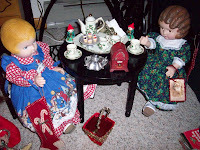 Although I have had many opportunities to take tea with my mother, we enjoyed peppermint tea (my father's favorite) in my grandmother's teapot on many cold winter evenings, the chance to share tea using these special cups was missed. Take time, make time, find time for tea with loved ones. This little guy recently celebrated his 5th birthday - January 29th to be exact. The picture where he is blowing out the candles; as his sister looks on, is actually his 4th birthday celebration. He had an army cake for that one. He put plastic toy soldiers all over the top of the cake including a few jeeps. Here he is celebrating his 5th birthday.Looking at the expression on his face, I think he was concerned about the responsibility of holding the cake and not dropping it! He directed how he wanted it to be decorated with a racetrack, a start and finish line, and grass in the center. Again, he added toy cars to the track. He also wanted a pit crew and an area for the visitors to sit, but I had to convince him that there wasn't enough room on the cake for all that. Adding the white divided line down the race track brought a smile to his face, he hadn't thought about that, but I could tell it was an acceptable feature to the cake! Older sister Angelica is holding the cake now, and the birthday boy is much more relaxed. It was a festive occasion spread out over a week, including family celebrations and kid celebrations. Turning 5 is pretty exciting! The littlest herb in our complex is growing up. Participating in a Valentine's Day card exchange is a fun activity! Here are some of the clever hand crafted cards that were mailed between friends in celebration of this fun day of sharing. Tucked into the cards were different little trinkets - heart confetti or chocolate-rose flavored tea, even mini pieces of chocolate. - Put the herbs in a nylon stocking or a piece of cheesecloth. Tie the cloth to the water spout and let the warm water wash over them. -Place the herbs in a pan of water and boil for ten minutes. Strain and add the decoction to your bath water. - Make a large muslin herb bag to hold the herbs or tie the herbs in a wash cloth along with a bar of castile soap. Wash with the bag. This works well in showers too. Mix the herbs ahead of time and use about 4 oz per bath. Different herbs have different properties. rosemary --astringent, relaxing for muscles and our favorite of course! Have fun, relax, put on pleasant music, light a candle or two and don't forget to take the phone off the hook! We recently visited the home of our friends Treva and Dan Smith. Both enjoy collecting. They have a train collection and a toy sewing machine collection, plus a very lovely doll collection, and the George Washington collection, and not to be left out the Abraham Lincoln collection, and on and on the collections went. All of them so beautifully and tastefully displayed. 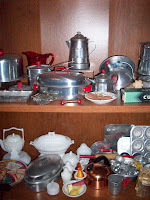 It was great fun for all ages in our family to see the charming finds. Then when we were done admiring the various treasures we were invited to see the whole miniature village they created in the basement. It was a lovely day. Thank you Treva and Dan! The little crooked building on the left is exactly that - The Crooked House of Windsor Cafe/Tea Room in Windsor, England. This unique location serves traditional British food, offers a wide range of loose teas, and scrumptious desserts. Last March I had the opportunity to enjoy lunch at this cute little cafe, a quick day trip from London. After enjoying a Jacket Potato which consisted of grated cheddar cheese piled high with thin slices of ham, all served atop a warm baked potato, I savored the most delicious sticky toffee pudding for dessert. This was a moist rounded cake flavored with dates, glazed with a layer of sticky toffee, slightly crusted, and served with warm cream. That was memorable! Although this other little cafe (right) isn't crooked, when I spotted it in Germany this past week, it reminded me of the Crooked House! After walking all around Rothenburg ob der Tauber, my friend and I enjoyed a typical German lunch here which included brats and sauerkraut. The meal ended with a serving of apple strudel, many thin sheets of pastry and equally thin slices of apples, rolled, sliced and served with warm vanilla cream and whipped cream liberally dusted with cinnamon. Another enjoyable European dessert! The herb of the year for 2008 is Calendula officinalis. Sometimes called Pot Marigold these cheery plants are not to be confused with French or African Marigolds (Tagetes). My hubby took this photo of the old fashioned single Calendula blossoms. I love it because it shows the differences in the shades of oranges and yellows the plant comes in. This variety of Calendula is the "officinal" variety and the best to use for medicinal purposes. Calendula is probably best known for its skin healing qualities. It is ideal to use in salves or in creams to help with any skin affliction: rash, scrapes, burns, wounds, diaper rash, etc. I simply infuse the dried calendula blossoms in olive oil for 2 weeks and then add a small amount of beeswax to thicken the oil and make a salve. It is also an edible flower that can be used in tea breads or to make pot marigold muffins. When the flowers are dried they maintain that beautiful orange/yellow color and are a colorful addition to pot pourri. The International Herb Association is the organization who selects the herb of the year. The herb chosen needs to have many facets of use such as culinary, medicinal, attractive to bees and butterflies, fragrant and/or insect repelling. Calendula certainly fills the bill. Valentine's Day brings on thoughts of chocolates everywhere and our area of PA is no exception. We are about 30 miles from Hershey, PA. Home of Hershey's Chocolates and the host of over 300 chocolate events in the month of February. On Sunday we visited one of the chocolate events called 'Chocolate Fest'. Every vendor features a chocolate treat in their booth. The Harrisburg/Hershey Hotel Sheraton had one of my favorite treats. White Chocolate Mousse with Earl Grey Tea Gelee. 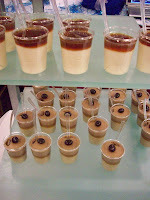 The Sheraton also gave equal time to coffee lovers with White Chocolate Mousse and Cappuccino and topped with a chocolate covered coffee bean. Everywhere Signs..... these are just a few of the ornate signs suspended from buildings in Germany. They represent hotels, guest houses, and the apothecary. They certainly add a bit of character and charm to the community, expressing their purpose without excessive lighting, plastic, or blinking neon words. Simple elegance. While strolling the medieval walled city of Rothenburg ob der Tauber in southern Germany one can't help but notice the personality of the windows on the individual buildings. Although it was the end of January, there was a definite attempt to create a welcoming atmosphere to this touristy area. The dried pine cones and other plant material in this lacy window were color coordinated and artistically designed, not just for one window, but if I remember, there were 4 matching windows. The second window, with its shutters open and little lace panels held an assortment of dried evergreens. The history of all these buildings is impressive - if only the walls could speak. The final window is that of a bakery which features the traditional 'snowball' pastry that utilizes all the little scraps of dough which are then shaped into a ball by a large metal press and deep fried and then dusted with confectioner's sugar, or for the more elaborate snowballs, they are frosted with chocolate glaze and nuts, why there's any combination of ways to elevate the stature of the snowball. In addition to the snowballs, the bread masks hanging in the window caught my eye, assorted faces all designed in bread bring a smile to passersby, enticing you in for a purchase. While vacationing in Germany, the German cuisine that we sampled typically was hearty, meat and potatoes, but notably well seasoned with herbs. The dinner served on the round wooden plate, was a piece of grilled pork topped with two thick slices of bacon and served atop toasted bread with a flavorful gravy. The leafy lettuce green, watercress perhaps, and fresh tomato were accompanied with a tasty herb butter. On Sunday afternoon, everything is closed except for a few restaurants. We found a lovely spot in the small town of Kettenhofstetten (Bavaria) for our early meal. Another piece of pork, this was served with a thick gravy and red peppercorns which added a nice mild peppery flavor to the meat artfully arranged on a square white plate. The steamed green beans had pieces of bacon tossed with them and were accompanied with tomatoes and deep fried potatoes. All very tasty. While dining, you are not rushed to complete your meal but rather encouraged to enjoy your meal and the companionship of family and friends. The waitstaff will not present your bill until you request it. Typically, the owner will visit each table, even sit down and chat with the guests. We muddled thru with the few German words we know sprinkled with a bit of English and a lot of smiles. The Essential Herbal Magazine is a bimonthly publication about herbs, it is written by and for anyone with an interest in herbs. Our friend Tina, is the editor of the magazine and she has graciously shared a free download of the most recent edition with our blog readers. This most edition includes many fun Spring articles including my article on Egyptian Onions. If you enjoy having a quality print magazine (that is mostly content with limited and focused advertising) come to your door on a regular basis then seriously consider this friendly magazine.